Here are some Do’s and Don’ts for hair care. Do: use a brush everyday. This allows the loose scales to be removed and stimulated your scalp. Don’t use a brush on wet hair, instead use a wide-toothed comb which won’t break hair. Start at the bottom in small sections and work your way towards the roots. Do: let your hair air dry as much as you can. This will avoid some unnecessary heat damage. 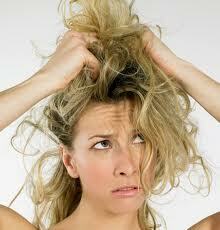 Don’t: use heat without applying a heat protectant to you hair first. The ones i recommend are carried by Nexxus and Tresemme. These come in a spray bottle form. Just spray all over hair and comb through, then you can begin heat styling to your hearts content.